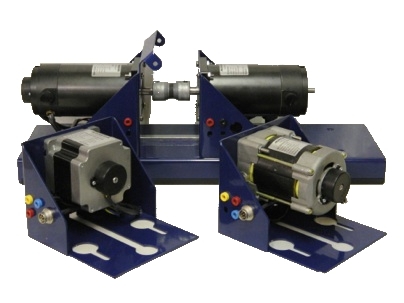 The basic dynamometer kit comes with (3) test motors including a PM DC motor, a 3 phase (4 pole) AC induction motor fitted with an encoder, and a PM brushless motor (8 pole) along with a calibrated PM DC generator used as a load. All motors except for the PM DC are fitted with an encoder, couplings and motor bases for easy interchangeability. All motors are design for a maximum of 42 V DC excitation for safety and the acknowledgement of future automobile accessory applications. The torque transducer option provides for test load generator calibration and in-line torque and power measurements for torque vs speed curves of test motors.